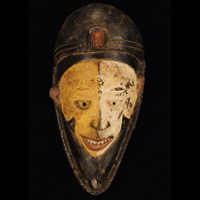 Perhaps the most famous African mask from the Pende is the Mbangu mask, or sickness mask, which represents the lifelong struggle between illness and health, played out on the face of a strong, virile hunter. Its opposing white and dark sides represent the battle between good and evil spirits which cause sickness. The badly distorted mouth and nose attest to the suffering of the afflicted, and his identity as a hunter reminds us that even the strongest, most respected among us may be stricken suddenly by disease. 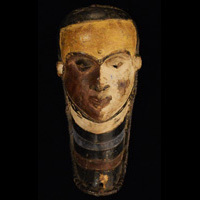 The Mbangu mask is used in rituals to heal the sick and, because sickness is thought to be brought on by misbehavior which displeases deceased ancestors, to teach morality lessons. 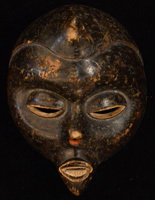 We features several Mbangu masks. While most African masks represent idealized types, revered animals or spirits, or emphasize grossly exaggerated features to frighten away mischievous spirits, the Pende are unique among African tribes in their willingness to address human sickness in art. 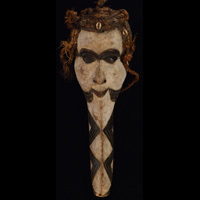 Other Pende masks touching upon this theme feature the pock-marked faces of smallpox or chicken pox sufferers. 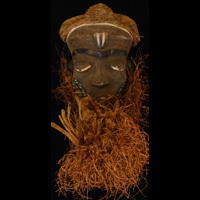 Pende masks are typically made of wood, with headdresses or beards of raffia fiber. Their eyes usually seem closed, or downward-looking, and the colors favored are black, white, red or ochre. 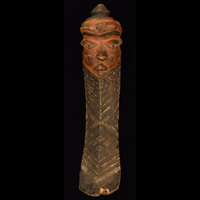 Cowrie shells, beads, and long beards carved of wood are also often present in these African masks from the Pende. They are danced in ceremonies celebrating crop plantings, initiations, circumcisions and appeasement of malevolent spirits.